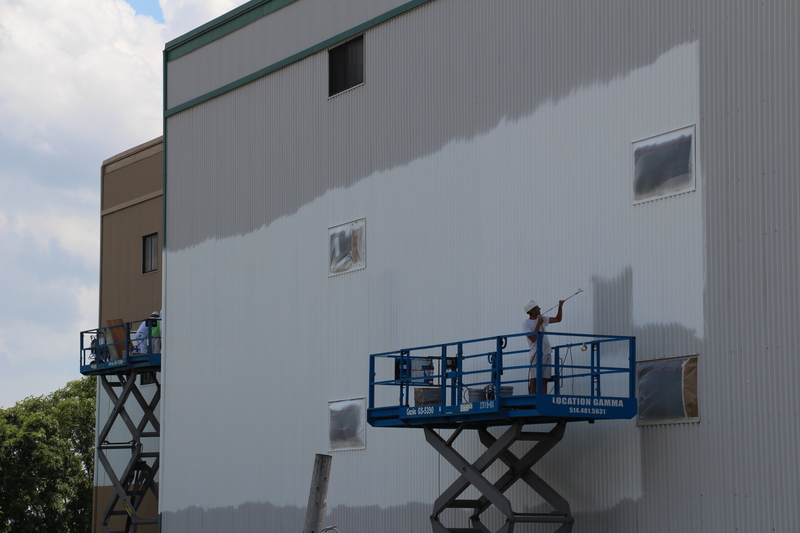 We call large surface painting the painting of both the interior and the exterior of several buildings stories: multi-residential buildings (condominiums, senior’s residences), commercial buildings (farms, department stores, etc. ), industrial buildings (warehouses, manufacturing factories, sawmills), or even institutional buildings (child care centres, schools, universities, hospitals). At FinDecor, we are often call upon to paint large surfaces. Three essential elements are always presents: the quickness of execution, the safety measures and the quality of the final work. Several tools now exist to help professional painters be more efficient and productive. First, the pressure washing machine that uses hot water and steam allows a productivity 50 times bigger than the traditional scraping methods. Then, the spray painting gun allows a productivity that is up to 10 times superior than with the roller and brush. The finish is often of better quality because we can adjust the thickness of the paint coat with the spray painting gun, which is impossible to do precisely with a roller. Sometimes, only one thick coat of paint is enough with the paint gun. As for the elevating platform, it allows us to reach a speed up to 50 times more rapid than the ladder. It’s logical because we won’t have to move as often the 10 feet large platform, so the surface gets painted a lot faster. At FinDecor, we don’t cut corners on safety! Indeed, our painters all followed the mandatory courses on health and safety at work. Moreover, the only authorized employees who can drive the lifts and handle the spray painting guns are the ones who did do the corresponding training. The safety harnesses are always utilized when we do painting at heights. Moreover, the team’s foreman applies the safety measures before begginning a painting project. (cutting the power when we paint close to wires, manage the trafic when we occuupy the sidewalk or street, etc.) and he supervises the work during all the project to make sure that the painters are always workings safely and that they don’t put in danger the neighbours or the building occupants.